For a celebrity chef who spends nights dreaming about food and days surrounded by extravagant culinary creations, living on the extreme poverty line for even a few days will be a challenge. 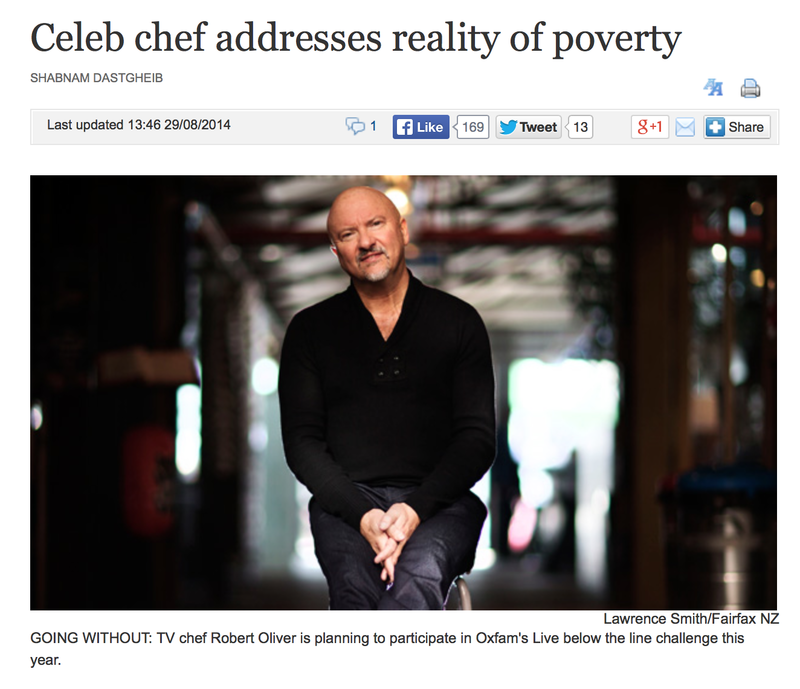 This year celebrity chef Robert Oliver has decided to give up most of his favourite edible luxuries to participate in Oxfam’s Live below the line challenge – a fundraising campaign challenging participants to live on $2.25 a day for five days. The idea is to connect with the more than one billion people who live on or below the poverty line. ”It’s going to be about eating a lot less for me…what does it feel like? We are so surrounded by choice in New Zealand, all the food is so extraordinary. It will be like being on a diet I guess, and the concept of a diet is still a luxury,” Oliver said. Raised in Fiji and Samoa, Oliver has developed restaurants in the US and Australia and food programmes to help feed the homeless in New York City. His work in the Pacific is focussed on development. He is the chef ambassador for Le Cordon Bleu culinary school in Wellington. Though he estimated he regularly spent at least $25 a day on food, was often surrounded by food and never skimped on what he wanted, Oliver had tackled weeks-long fasts before. Oliver said he wouldn’t take part in any tastings or freebies – a regular part of a top chef’s day. Clean eating, organic fruits and vegetables, fish, whole foods and good coffee make up Oliver’s regular diet. He dreamed about food most nights and went to great lengths to have the food he wanted – even flying internationally at times specifically to eat at certain restaurants. For the challenge Oliver hadn’t yet plotted a specific game plan other than filling up on miso broths, ”gingery spicy things” and complex carbohydrates to keep himself grounded. From his past challenges he knew he might feel light-headed at times.Oliver heard about Live below the line through fellow My Kitchen Rules judge and celebrity chef Nadia Lim, who has done it in the past. He said he would be asking her for a few tips as he neared the October challenge.